Reluctant love and shared faith blossom during the daily chores and arguments of tobacco farmer Drew O'Connor and Lady Constance Morrow. Constance is everything Drew despises in a wife - she cannot cook and she prefers mathematical equations to cleaning. Worst of all, she has red hair! But when the two are forced into a marriage of convenience, Drew soon realizes how blessed he truly is. RITA Award finalist Karen Witemeyer pens heartwarming historical romances that lift the spirit and the soul. Short-Straw Bride finds Meredith Hayes struggling to let go of her childhood crush on Travis Archer - the strapping young lad who saved her as a little girl. With a sensible proposal from the eligible Roy Mitchell on the table, it’s time for her to move on. 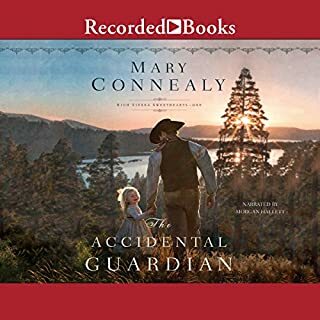 But when Meredith overhears a plot to drive Travis and his brothers off their coveted land, she has no choice but to intervene. 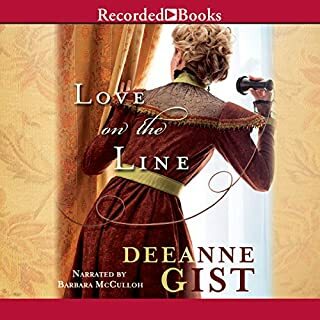 This inspiring romance by Christy Award winner Deeanne Gist sets a spirited gal and an enterprising lumberjack on a collision course in 1866 Washington Territory. Set to lose half his timberland unless he finds a wife soon, widower Joe Denton places an order for a bride who can cook. When she arrives, the bonnie lass certainly cooks up a storm - but she knows nothing about marrying Joe. This was a very slow paced romance that had it's emotional, funny, romantic and sad moments but I found myself scrolling along some chapters in order to get to the end. This is not because it was a horrible story or badly written but it just isn't my preferred listen. 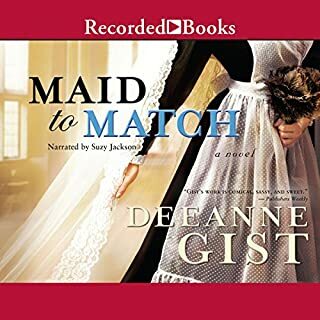 I also didn't realise that this was an inspirational Christian listen - not that that would have put me off but I'm sadly more into bodice ripper historical or paranormal romances. So, if you're looking for a light, sweet romance that has no 'hot' spots except kissing then this is your book. The author's comments at the end were interesting as she explained most of what the premise of the story was true and a lot of the things that happened were accurate and a historical fact. Worth a credit? Unfortunately, not mine but there are many listeners out there who may enjoy this. 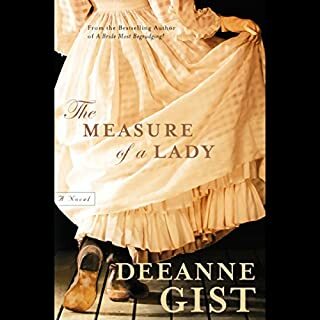 I think a lot of people who enjoy Christian fiction with a bit of humor and a light touch would probably like this historical romance. The relationship between the main characters actually developed over time, and that was a nice plot line to see. I could actually understand WHY the characters grew to love each other. Supporting characters had their charm as there was a "seven dwarfs" quality to the woodsmen characters. I appreciated that the author included pertinent details about the time period, especially about the mail order brides. The story dragged on a bit towards the end with a sort of Perils of Pauline feel to it. 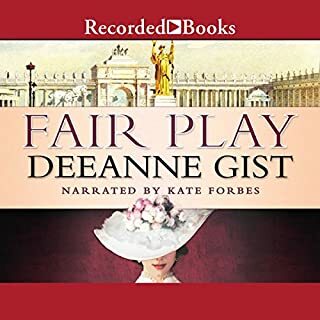 The narrator did a great job of narrating the story, so it did not sound too melodramatic, but the writer seemed to feel that the more "tension" she added the better. The result was that the last few chapters, in parts, were a bit silly. Additionally, the heroine's main reason for not desiring marriage seemed very immature for a character that seemed to have her head screwed on straight. I understand she was supposed to be traumatized, and actually appreciated the reason for it, but it just didn't ring true with me. At the risk of sounding totally heartless, I just rolled my eyes. 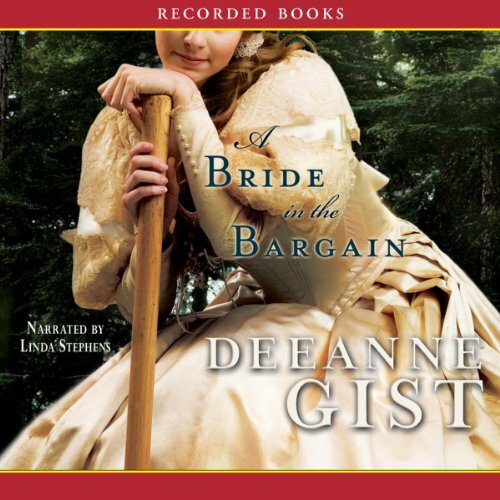 I truly enjoy Linda Stephen's understated dramatization of the stories she narrates. Her voice is pleasant, and she does not over nor under emphasize what she narrates. The characters are still well delineated, and there is enough inflection to keep things interesting. She was very pleasant to listen to, and I have felt that way about some of her other books. I enjoyed the book enough that I looked forward to listening to it, but it was not so exciting that I could not put it down. Overall this was a sweet, often amusing, love story, and I felt that I used my credit well. Deeanne Gist is an amusing storyteller. I admire her handling of faith in the midst of messy situations. I did not enjoy, however, this book's lust-gone-nuts focus. Leaving the details of a lustful imagination to the imagination of the reader is quite romantic. Filling in a constant description of those thoughts AS the story robs from story-telling. Needless to say, this was not a favorite offering from Gist. Save your money, save your credit. I couldn't stand the spoiled, demanding female and spent most of the time hoping the male lead would shake her or yell at her OR something! It may have been the narrator's voice that bothered me too b/c although she wasn't horrible, she was definitely not great. Someone owes me a credit...audible for offering this or the author for writing it...I'm not sure but someone owes me a credit.